The Cameron Parish School Board will receive sealed bids until 4:00 PM Monday, April 8, 2019 for collection of approximately of approximately 3080 alligator eggs on School Board owned lands, at which time all bids will be opened in public session of the Cameron Parish School Board in Cameron, LA. Collection of alligator eggs will be permitted only on School Board lands identified by the La. Dept. of Wildlife and Fisheries and in accordance with the number of eggs authorized by the Department for collection. 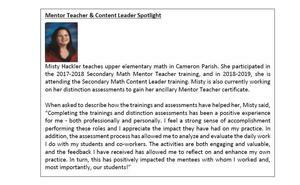 Mrs. Misty Hackler, Grand Lake Upper Elementary Math Teacher has been recognized in the Feb 2019 Teacher Leader Newsletter. 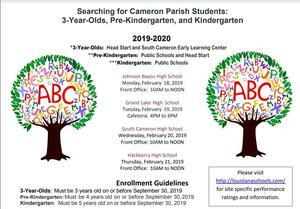 The Cameron Parish School Board has approved the 2019-2020 School Calendars.